This discussion is extracted from a web page of mine , and is a continuation of a previous commentaries  . There has been a lot of hype recently over Elon Musk’s proposed Hyperloop  mass-transit system. Many see it as a rival to California’s High-Speed Rail (HSR)  proposal. Unfortunately, both Mr. Musk and the California HSR people overlook one important thing: What is the door-to-door speed of the trip? Consider a typical inter-city trip: You might drive the whole way, but then you’d face traffic, tolls, large trucks, limited speed, and fatigue, and the possibility of an accident. However, you do have the convenience of a single-vehicle trip. Or, you might choose to use some form of mass transit, such as plane, train, or bus. You will probably need to use some form of mechanized transport just to get to the station or airport, such as driving there and parking, or have a friend drive you there, or use a local bus, cab, or “limo”. At the “destination” station or airport, you will need a similar service to get you to your final destination. The point is, just minimizing the travel time between some point-A and point-B isn’t good enough. Let us change our terminology a bit to put things more in perspective. The trip would be from point-A to point-D, while the possibly-high-speed segment would be from point-B to point-C. In addition to maximizing the speed from B to C, we also want to minimize the time from A to B and from C to D.
One of the main purposes of hexOgrid is to put rails close to anyone who may want to use them — to minimize the distance between A and B, and, symmetrically, between C and D. Let’s face it, we will not have a transit system (other than good-old-fashioned roads) that permeates down to each individual driveway. But, if we can have a system so that you don’t have to travel more than ten miles, by road, to your nearest depot, then the A-B and C-D distances will be minimal. This is done by having parallel rails close together, about eighteen miles apart. Having many rails, going in the same direction, provides redundancy, so, if one rail is out due to weather, sabotage, or accident, the network can still function. The hexagrammoid shape of the grid is also designed to give a smooth ride by limiting the acceleration (g-force) that the passengers feel. The hexOgrid network is originally designed for use with a 300-mph (500-kph) Danby-Powell  MagLev Rails, in a proposed system called LeviCar . 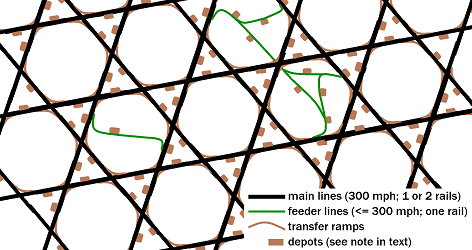 The overall shape of the hexOgrid was determined by several needs, including (1) having depots within ten miles by road from any point in urban or suburban (built-up) areas; (2) limiting g-forces during acceleration and switching to tolerable levels; and (3) providing redundancy so that loss of one rail will still leave a functional network. By having the rails change direction by 60° rather than 90°, the time and distance spent at each junction is lessened. I talked with a railroad man about RoboTrail and LeviCar, and he commented that hexOgrid can also be used for conventional rails. It is also possible that it may also have application to highways, conveyer systems, and urban planning. The major difference will be that, with vehicles running at different (usually lower speeds), the sizes of the grid will be different, in proportion. 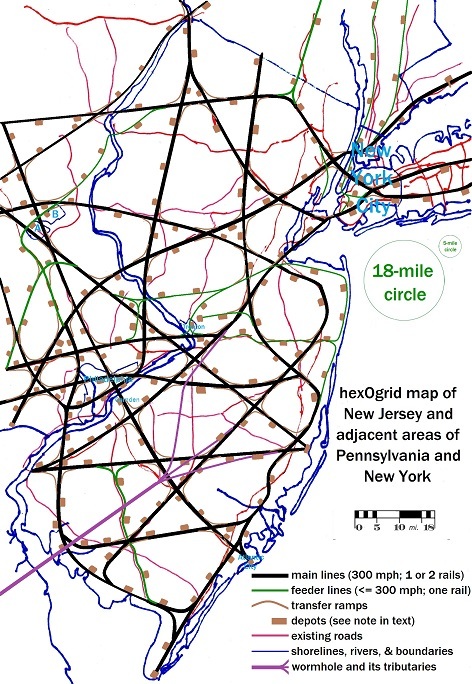 The diagram above shows an idealized “Exemplary Grid” that could cover a geographic area with overlapping hexagrams. In additional to the main rails (heavy black), there are transfer ramps (brown) to go from one rail to another, and feeder lines (green) to provide access to areas off of the main grid. The main lines will carry vehicles at 300 mph, while the feeder lines might operate at lower speeds. Also, there are sidings that lead to depots. It is important to note that these are not “stations”, where the whole train is stationary, but rather “depots”, where a LeviCar or a RoboTrail freight container is either deposited on the MagLev Rail, or taken off the rail and deposited on a road chassis or flatbed truck. Note: The small scale of the maps precludes detailed representation of the depots. They actually involve acceleration/deceleration ramps and several facilities for transferring LeviCars and cargo containers. Depots are located one side of the rail or another, and are so pictured. Whichever side that they’re on, they service vehicles heading in both directions. In its actual implementation, hexOgrid will probably not be an exact hexagrammoid grid, as depicted above, but will be adjusted to meet local needs, including topography, environmental impacts, local laws, availability of rights-of-way, and other legal considerations. The map below depicts a representation of how such a practical grid might look for the State of New Jersey. Notice that the grid is not set up to facilitate travel within the State, but is mostly for travel into, out of, and across the State. Also notice the “wormhole” going from the Pine Barrens of southern New Jersey, towards the First Coast area of Florida, near Jacksonville. This will provide super-fast passenger transport for snowbirds to get to warmer climes. Please note that LeviCar does not use trains, but rather individual vehicles, each constituting the body of one modular car. For road travel, this car body is mated with front- and rear- chassis that together contain the drive train and power source. Propulsion is through electric hub motors within the four wheels. For travel on MagLev rails, these chassis are removed, and replaced with a “bogey”, which rides upon the rail, going non-stop from point-B to point-C. This provides for one-vehicle ransportation over long distances. Mass-transit vehicles, such as coaches, vans, and buses can also be provided. For freight, a similar “RoboTrail” service uses the same MagLev network, but different depots, to handle everything from four-foot-long parcel containers to 53/56-foot-long multi-mode freight containers. Please see www.LeviCar.com  for more details, as well as links to related sites, and other information. The heart of hexOgrid is to be able to easily switch rails to change the direction of travel. For MagLev rails, this can be done only using the Danby-Powell architecture, which permits near-instantaneous switching without slowing down, because it’s all done with magnets. Road vehicles can switch very fast, without breaking stride, but at a lower speed than MagLev. Conventional railroads can switch fairly fast, but usually have to slow down. The hexagrammoid grid is mostly for through traffic, and has ramps to switch from one direction to another, ideally changing direction by 60°, but not slowing down. Centripetal acceleration (g) forces are kept to within a tolerable range, perhaps 1.2 g total (Pythagorean sum), and the ramps are appropriately banked to minimize discomfort. There are also sidings that come off of the main grid and go to depots (see discussion above), or directly to hotels, resorts, hospitals, shopping malls, factories, or warehouses (see discussion below). These are specially designed to decelerate vehicles from full speed on the main rail, to a standstill at the depot or the “direct destination”, and likewise to accelerate the vehicles going towards the main rails. The vehicles that are not going to the depot stay on the main rail and don’t slow down. In congested areas, you would want to have the distance to the nearest depot to be less than the ten-mile standard. Feeder rails come off from the main rails, and have several sidings coming off of them, and then rejoin the main rail grid somewhere else. These might operate at speeds slower than the standard 300 mph, and can more easily follow existing rights-of-way. Lastly, there is a big difference between travel on the main rails, and on the other rails. Travel on the main rail is fast, continuous, and regular. Travel on the others might be at a slower speed, might involve acceleration or deceleration, might have vehicles entering and leaving the rail at irregular intervals, and might have vehicles traveling in one direction at some times, and the opposite direction at other times. To smooth over the transition from one rail to another, the main rails might have parallel sidetracks, such that a vehicle will go onto a sidetrack before going on a ramp, siding, or feeder; or likewise go from a ramp, siding, or feeder onto a sidetrack before entering the main rail. Notice that feeders might also have sidetracks of their own to transition to their own sidings. Also, the addition of sidetracks would affect the per-mile cost of the rail. A single track with a sidetrack would cost more than a single track alone, but might substitute for having a two-way pair of tracks. A two-way pair with one sidetrack would cost more than a two-way pair of tracks alone. These additional costs are justified by making the system much more useful. Note that, for elevated MagLev rails, it is desirable to build them over existing rights-of-way in built-up areas, and that means that in some places, you can’t really use the idealized hexagrammoid grid. In rural and wilderness areas, you have more freedom to place the main rails according to the idealized grid. Above, we discussed a trip from point-A to point-D with a high-speed segment from point-B to point-C. However, in many cases the link from C to D might not be necessary. Suppose you are visiting a historic city. Once there, you plan to get around by walking, buses, subways, and taxis. It would be possible to have a MagLev or other line go directly to your hotel, where you would unpack. Your vehicle would then be automatically driven to a secure parking facility. At the end of your stay, it would be automatically conveyed right to the hotel lobby, where you could repack and go on your way. Alternately, the hotel could be built with special conveyers and elevators so that your car could stay right in your hotel suite, but that would be expensive. Hospitals could have direct MagLev lines to their emergency rooms. If any passenger becomes ill on a trip, the vehicle could be redirected to the quickest available hospital, without waiting for the trip to be completed, as with Hyperloop. It would be possible to have MagLev and other lines go directly to warehouses, without having to carry the freight from the depot to the warehouse on the back of a flatbed truck. Likewise for factories and shopping malls. Each could have conveyer systems (in the basement, for shopping malls) to take items from the hexOgrid portal to their individual destinations (individual stores, for a shopping mall). In fact, it could be possible for freight to travel almost completely by hexOgrid, except for the last leg when the destination is not big enough to justify the expense of such a portal. What about the stores and other freight destinations in the historic center of an old city? You can’t go ripping up everything to install hexOgrid depots, which many locals might consider to be unsightly. It would be best to position the hexOgrid depots right outside the historic district, and to use only smaller standard freight containers, such as 20-footers. Each depot would have a fleet of electric flatbed trucks to take the freight the final mile or two. Also, the drivers of these trucks would be totally familiar with the area. After the initial hexOgrid is built, it can be supplemented with some different higher-speed (and higher-cost) mode, allowing a shortcut tube between distant parts of the grid. I propose calling such a shortcut tube a “wormhole”, as explained in a previous commentary . The standard-speed mode might be MagLev (300 mph / 500 kph); and the higher-speed mode might be something like Vactrain  or ET3  (2000-mph / 3000-kph), or even Hyperloop  . A vehicle enters the network at a standard-speed depot, and travels a while on the the standard-speed network (300-mph for MagLev), and then is switched to the higher-speed mode (wormhole) without stopping, and is later switched back to the standard-speed network, finally coming to a stop at a standard-speed depot. It is also possible that the trip might be in five (or seven or nine) alternating segments of standard-speed and higher-speed conduits. This means that the vehicle must be compatible with both the standard-speed and higher-speed conduits. If the bottom of the vehicle is built to ride on a Danby-Powell MagLev rail, then such a rail probably has to be incorporated into the wormhole. If a vehicle needs to have some sort of a protective dome or fairing (to manage air resistance at the higher speed, or to keep the air in while traveling in an evacuated tube), such acoutrements have to on the vehicle the entire trip, both on the standard-speed mode and the wormhole. The undercarriage and dome or fairing can be applied as the vehicle enters the standard-speed network for the first time, and removed when it leaves it for the last time. An architecture of transportation conduits is described that can provide close-by service for both passengers and freight, with comfort for the passengers, and redundancy to enhance reliability. It was originally designed for 300-mph Magnetic-Levitation (MagLev) rail, but can be used with other systems. It forms the basis for the LeviCar / RoboTrail system. It is dedicated to the concept that it is more useful to provide shorter door-to-door transit times to most people, than to provide really fast transportation between select cities. Also, by being so versatile, and usable for all kinds of passenger and most kinds of freight, there should be a lot of mileage revenue that can easily amortize the high construction costs.